Fed Up with Frenzy? Things to Make and Do. As a kid one of my favorite things to do was to pour over various Make and Do books which were so prevalent in those days. They were full of crafts and recipes and games and ideas for filling up the days with fun and creativity. As an adult, those books are still some of my favorites and I have a wide collection of various tomes from the 50s, 60s and 70s that I have picked up over the years at thrift stores and book sales. I pick them off the shelves at various times of year and leave them scattered about the house just waiting for some passerby (read: one of my four children or me) to pick one up, peruse its pages and get inspired. In these books there is truly something for everyone. I have often wondered why there wasn’t a modern day equivalent to these books. Books that are timeless in their content and ageless in their target market. 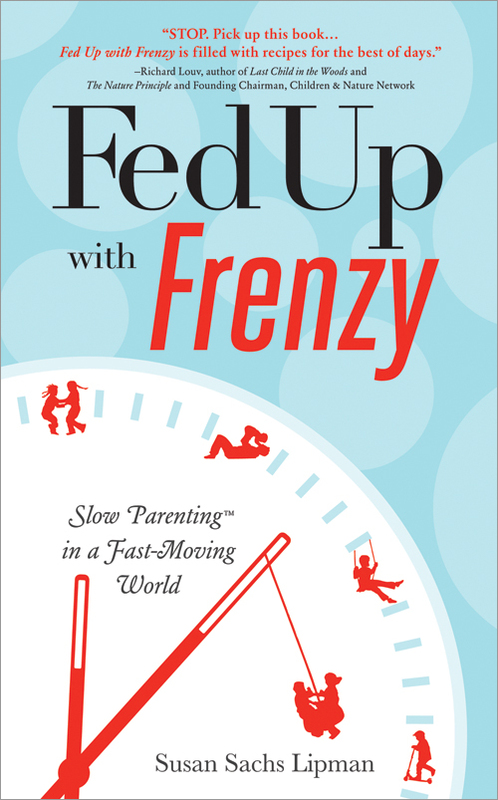 And then Suz Lipman of Slow Family Online sent me a copy of her new book; Fed Up With Frenzy; Slow Down. Reconnect. It’s easier than you think. It is a beautiful Make and Do book for families with a focus on slowing down and finding family connection within the tasks and activities. It is full of thoughtful suggestions for living family life, games and crafts and garden activities. It has ideas for rituals and kitchen projects and family celebrations. And if you leave it out on the table in your house I guarantee someone will get inspired to create something magical that will surely spur your family onto feeling more joy and more connection. I received my copy shortly before our big family road trip and tucked it in my travel bag. A few hundred miles in I pulled it out and went right to the Travel Games section. It is full of games to play in the car – some I remembered from my own youth, and others that were new to me or offered a twist I never thought of. For the rest of the trip, each time we needed inspiration we pulled out the book in search of what to do next. We took turns flipping through the pages finding ideas for things to do or just reading along for future plans and projects. Now home I’m excited to dive into some of the kitchen projects with my kids – crafts and fun science projects. We’ll leave this one out on the table for months I’m sure and turn to it each time we need simple inspiration or ideas for things to do together or just a good read on a lazy afternoon. This is the book of Make and Do but it is so much more than that. It will give you ideas for things to do with your kids. Ways to add more beauty to your home and your yard and the community at large. It will remind you that the road to connection is paved with simple things – things all within our grasp. You should totally get a copy and display it prominently so that each time your seeking ways to reconnect, you’ll find it here in these pages. Thanks to the author I’ve got one copy to giveaway which I’ll be doing next Wednesday on my site. Leave a comment here and tell me what was the last project or activity your family did together or what one you’ve got planned for the near future.